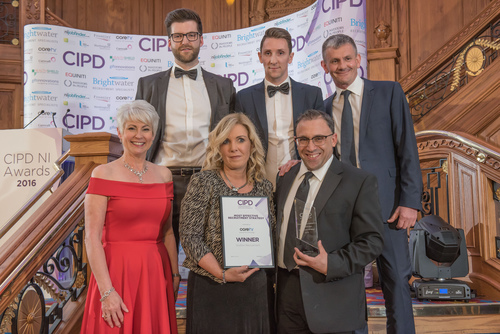 Grafton Recruitment has been awarded 'Most Effective Recruitment Strategy' 2016 by CIPD (Chartered Institute of Personnel and Development) Northern Ireland. The award was given for the recruitment sourcing campaign for OneSource Virtual (OSV), a leading Texan based Business Process Outsourcing provider, who decided to open a European Hub to service and develop their European offering in Derry/Londonderry in late 2015. As the exclusive recruitment partner, Grafton created a recruitment sourcing strategy that was collaborative and innovative, the solution reflected the culture and employer branding aspirations in the local market and this proved effective with the target audience. By understanding Gen Y’s preference for use of social media they maximised the opportunity to interact with prospective candidates right along the recruitment value chain. The initial recruitment campaign resulted in 50 job offers, attracting people to return to working in the city of Derry/Londonderry where historically they would have had to travel to Belfast or even further afield to get skilled employment with the level of salaries offered. The employment opportunity has already brought an additional £1.63M in salaries per annum to the City of Derry/Londonderry economy and over the three year recruitment period it is estimated to bring in excess of £12M. Pictured left to right. Back row; Ryan Calvert, HR Specialist, Grafton; Richard McFarland, Business Manager, Grafton; Mark Sexton, Enterprise Sales Manager, Core HR (Award Sponsor) Front row; Pamela Ballentine, Gala Host; Julie Cordner, Marketing Manager, Grafton; & Pete Feldman, MD, Grafton.